Last week we chose to celebrate Valentine’s Day with a quiet dinner at home consisting of homemade pizza, craft beer, and cupcakes. As we were cleaning up dinner, I suddenly realized I forgot to take pictures of the delicious BBQ BLT Pizza we had (aka we devoured it and we weren’t stopping to take pictures) so I figured since I already stole Iowa Girl Eats recipe I may as well steal her mouthwatering pictures as well. 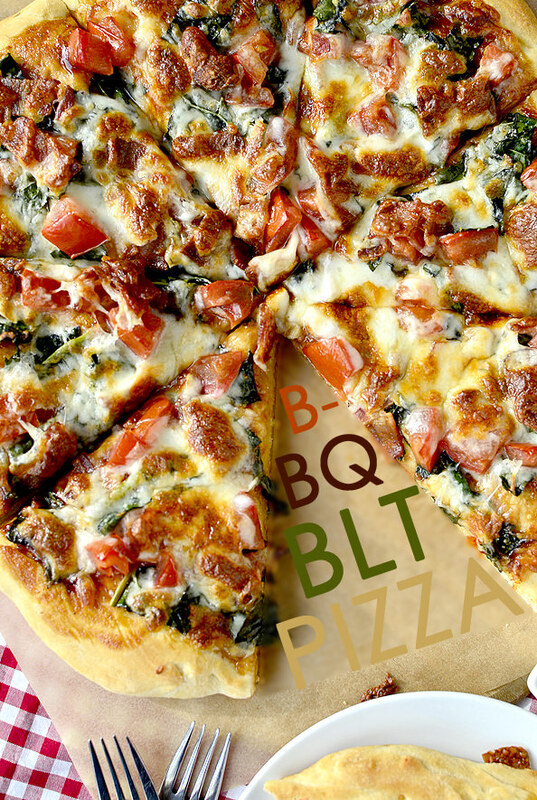 People, this pizza is super easy and delicious – it is filling without feeling heavy and tastes so fresh and healthy. 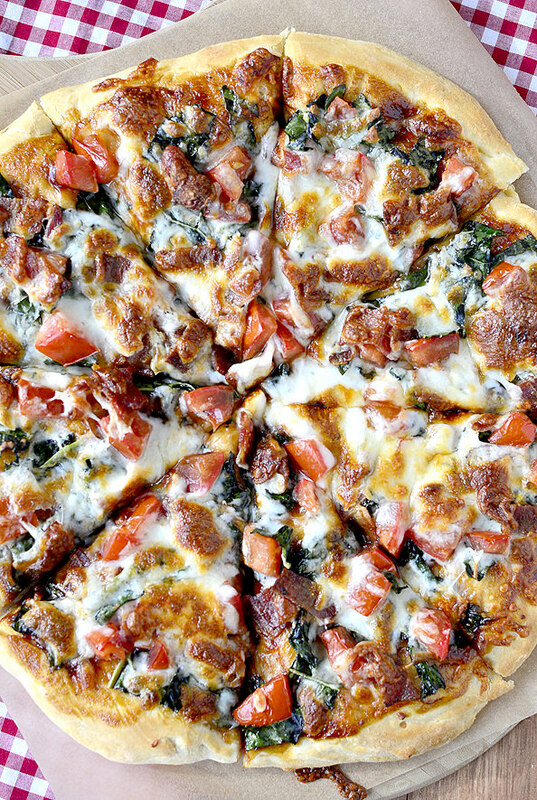 Instead of ordering pizza or buying a frozen pizza this weekend make this, you will not regret it. Line a baking sheet with foil, place a cooling rack on top, and spray with nonstick spray. Lay bacon slices on top of cooling rack and place into a cold oven. Set oven to preheat to 400 degrees. The bacon will cook gradually as the oven heats up. Continue to cook at 400 degrees until the bacon is crispy (about 5-7 minutes). Allow the bacon to cool slightly and then chop. While bacon is cooking, prepare the kale. In a bowl, place 2 cups of kale, drizzle with 1/2 tablespoon extra virgin olive oil, salt, and pepper. Massage the kale with the mixture for about 30 seconds. Spray a pizza pan or baking sheet very well with nonstick spray and spread the pizza dough into an even layer. 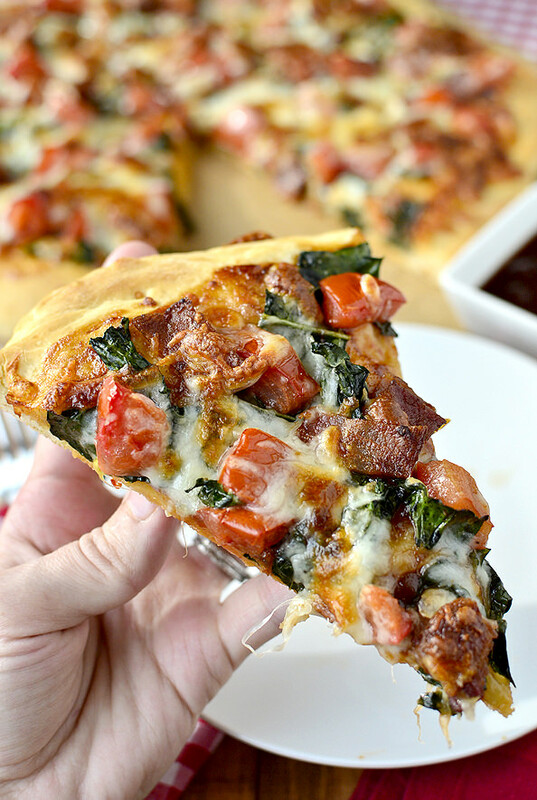 Spread BBQ sauce on top then layer on prepared kale, tomatoes, chopped bacon, and mozzarella. Bake for 10-15 minutes until crust and cheese are golden brown.